It's been a busy week. Between meeting with clients, going to a mixer and doing my daily social media extravaganza, it's a wonder I still have time to sit down and actually design and illustrate. It can be a little overwhelming at times, but don't get me wrong, I love what I do for a living. It really is a privilege to design and illustrate for others. They're placing their trust in you to tell their story. But today (11.11.10) I woke up to some great news. Sneh Roy, co-founder of LBOI (Little Box of Ideas), a design studio in beautiful Sydney, Australia held a giveaway where the winner would become the recipient of a hard-to-get Dribble Invitation. All you had to do was submit a piece of work you love. In case any of you are not familiar, Dribble is "essentially a visual twitter for designers" and it's extremely difficult to get an invitation to join this fine community of designers. Well, the kind and beautiful Sneh Roy picked my work. It might look familiar to you. As you can imagine I was ecstatic and so appreciative, but I looked at my yellow pad and realized how much I had to do today. It's then that I remembered a blog post by another fine Australian lady, Susan Oakes, marketing professional at M4B Marketing. The post was named The Benefits of Chilling Out From Marketing. In it, she explains how we simply need to relax before we burn ourselves out. So I decided I would take care of what needed taking care of, but I would then take the rest of the day off (which here in the States is Veteran's Day) and sketch and draw. So I broke out my pencils, pens, brushes and watercolors and I did. Attached is the result of such a day. 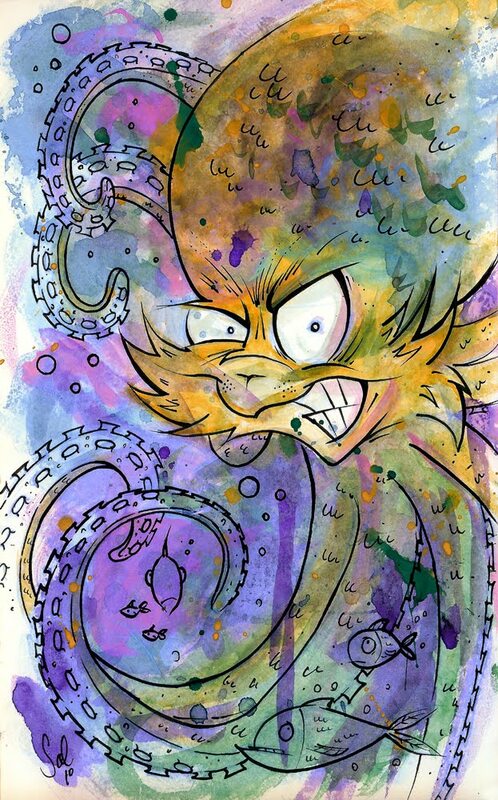 This watercolor painting stars a character of mine named Octo-Puss whose origin is shrouded in mystery. I just want to give these two ladies a warm and hearty 'Thank you" for inspiring me today. I really needed it. Everyone have a great weekend! Congrats! on making it into Dribble. I loved your Halloween drawing, it was a good choice. Congrats! 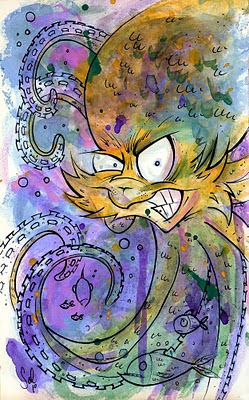 on spending the day with Octo-Puss, he is looking good. more organized, to make time for the things that are important. Congratulations on the Dribble invitation! @Tricia Thanks! I'm glad you like them. I was going for complimentary colors but I decided to muck it up a bit. @Sheila I encourage you to pick those brushes and watercolors and go for it. It will make your day when you spend a little time on you. Thank you! Congrats man! Dude, this guy looks awesome. He's definitely come a long way. it reminds me of how mickey mouse has looked different over the years. @Paul The best award is the recognition from your peers. Thanks for visiting, Paul. Congratulations are your award Dennis. You are certainly in the flow. The flow actually started, on Nov 11. Your work of which I have only seen your Halloween drawing and this, vividly display the love you have for your work. Thanks for letting us know about your award. Hey that's wonderful Dennis! So pleased for you. And I love how you followed Susan's advice and as a result won the price!! Congrats man!! And thats an awesome Octo-Puss!! Creative stuff!! Congratulations and well deserved. I love your pictures and your creativity. Thank you so much for including me and my post in this article. Appreciate it. Congratulations on the award. I love the fact that you were inspired by a fellow blogger. Like you, I read Susan's posts regularly. Glad you took the time to pursue your passion for the afternoon. Loved your design and use of color. Congratulations on your award! What a shining example of a "win-win" scenario for all parties involved. Your work is beautiful and you must be so proud! It is so important to take some time off! Often the best work comes out of it. Good for you! And please tell us more about this twitter for designers once you start, OK? Amazing. amazing and more amazing! You Rock!! Thanks everybody and thank you, VBN!